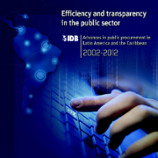 Green Procurement: How to Encourage Green Procurement Practices in IDB Funded Projects? Comprando verde: ¿Cómo fomentar las compras verdes en los proyectos financiados por el BID? Bringing PPPs into the Sunlight: Synergies Now and Pitfalls Later? In recent years, Latin American and Caribbean (LAC) countries have madeimportant advances in the modernization of their public procurement systems.